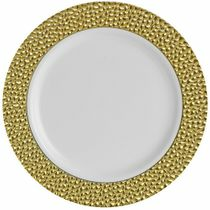 Home»China-like Tableware»Hammered Collection - Various Colors»Hammered Collection - White w/ Gold Hammered Border»Hammered Collection 7" White w/ Gold Hammered Border Salad / Cake Plastic Plates 10ct.»Gold Hammered Gold Plastic Teaspoons 20ct. Hosting a party or Planning a Wedding? 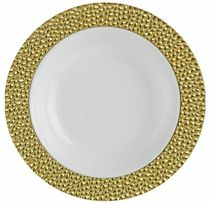 Change the look of your table and awe your guests with these Elegant Hammered Designed Gold Cutlery. With its fine Elegant design this Cutlery set is sure to bring your event to the next level. Quit the hassle of washing dishes go green go Disposable a luxurious look of Real Silverware at a fraction of the cost Great for weddings, Receptions, Birthday parties, Baby showers, holiday and family gathering, or any Catered special event.